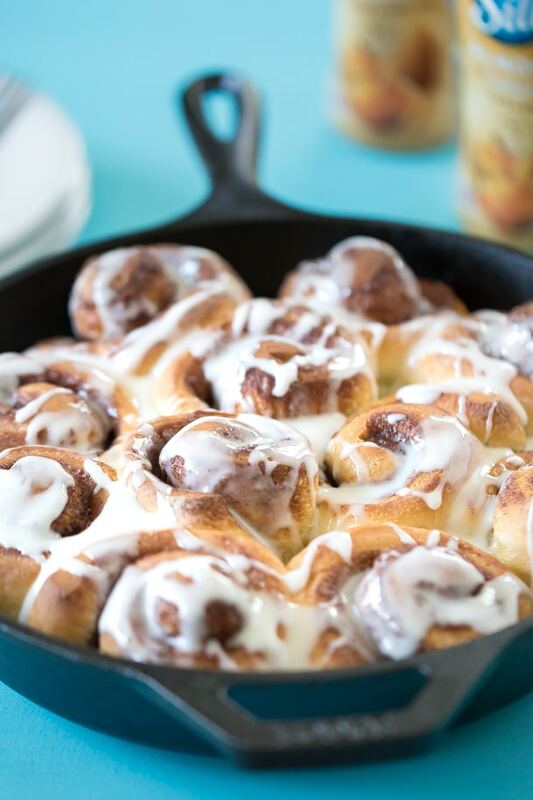 Cinnamon rolls have always been one of my favorite breakfast items, especially when they’re drenched in glaze and nice and warm. There’s only one problem. They’re a lot of work and they most recipes include milk or cream cheese. There’s always the prepackaged option, which I’ll totally go for in a pinch, but they’re not my favorite choice because of all the mystery ingredients. Enter frozen bread dough. I absolutely love it. 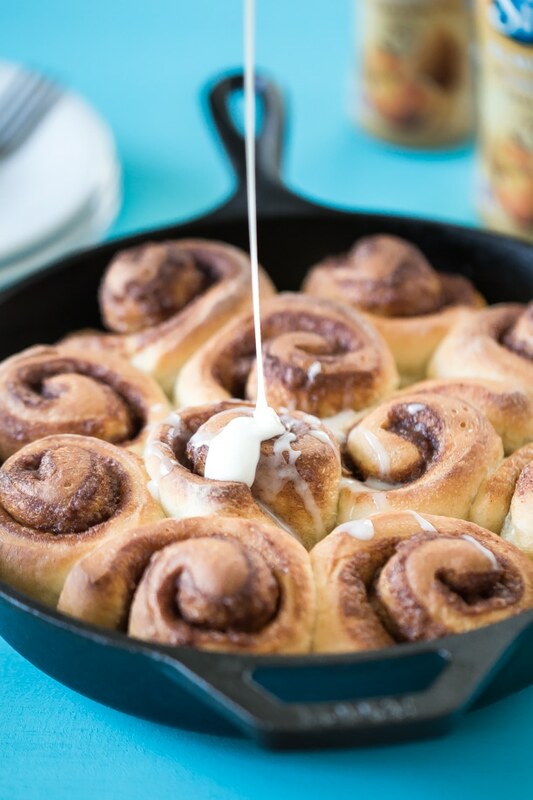 It’s perfect for speeding up the whole cinnamon roll process and it’s pretty cheap. The remaining ingredients are pantry staples: coconut oil, brown sugar, cinnamon, powdered sugar and Silk Almondmilk and Cashewmilk with Caramel Bottles. Obviously we are a fan of almond milk, but I love having these little bottles on hand for recipes because they’re shelf stable and they bottles are usually the perfect size for recipes. 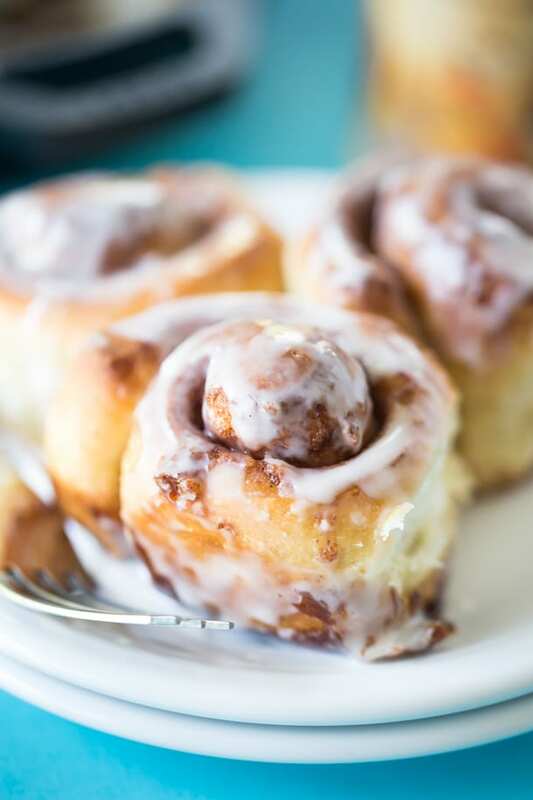 These cheater cinnamon rolls make life so much easier for me, I can even make them during at the start of the week and heat them in the morning for a fast, indulgent breakfast. 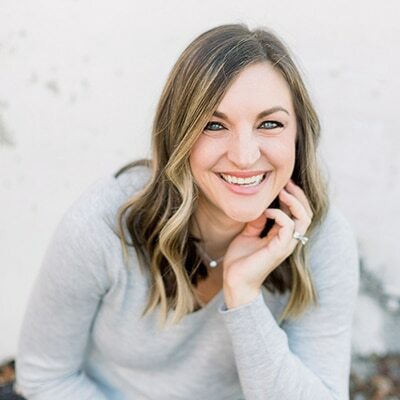 I know they’ll make our first back-to-school season – yes, Ellie is going back to preschool this year – and it’s especially important for me to make things run smoothly since I’ll be caring for a little one come November. I’m all about making the most of our last few months as a family of three, and really enjoying my mornings. 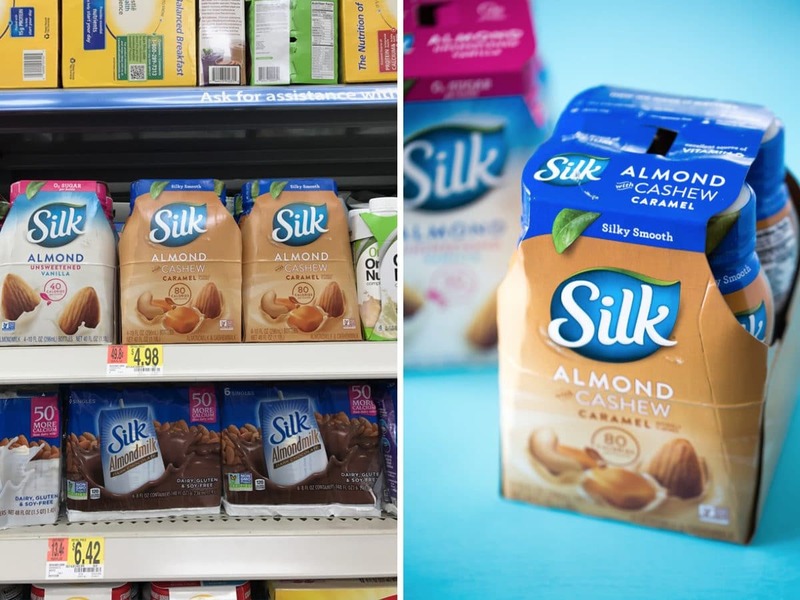 We normally buy unsweetened original almond milk, so when I need the sweetened caramel version or even Silk® Unsweetened Vanilla Almondmilk, I can pop open one of these little bottles and it’s just as fresh as the refrigerated carton. Plus, nothing will go to waste. I know the thought of shelf stable milk is weird to a lot of people, but did you know that milks of all kind are sold like this in other countries? In France, we always got our milks (dairy, lactose-free and non-dairy), from a shelf in the grocery store rather than in the refrigerated section. It seemed weird at first, but I learned to love the convenience. 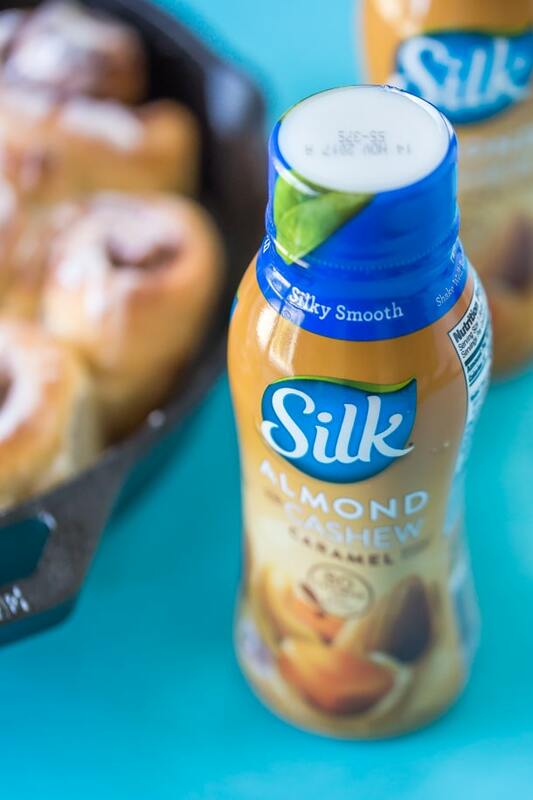 For my 6 ingredient cinnamon rolls, I used Silk® Almondmilk and Cashewmilk with Caramel from Walmart for a little extra flavor in the glaze. It adds a nutty flavor combination kissed with caramel, plus it’s an excellent source of calcium. You can use any flavor of almond milk, sweetened or not, because you’re adding it to a heap of powdered sugar anyway. And, of course, it’s free of dairy and lactose, and funky ingredients like artificial colors and flavors. 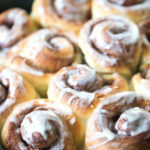 To make these 6 ingredient cinnamon rolls, I thawed the bread dough in my refrigerator overnight, and then I set them out of the counter to rise in a covered bowl for about 45 minutes. While the dough was rising, I prepared the filling and the glaze. The filling is just melted coconut oil (or dairy free margarine if that’s what you have on hand) topped with brown sugar and cinnamon. 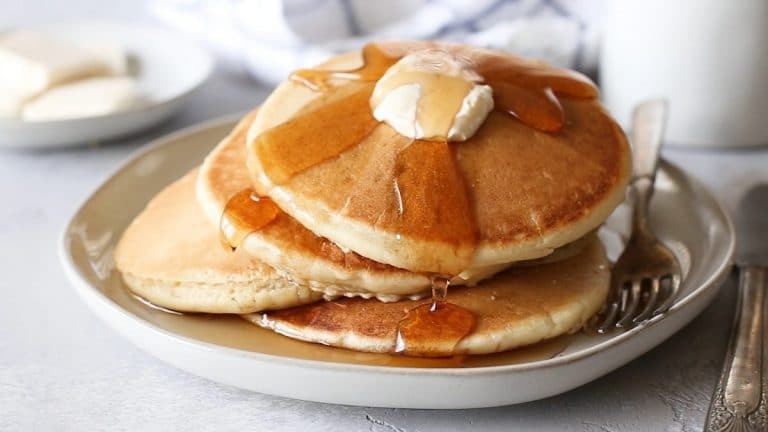 The glaze is just powdered sugar whisked with almond milk. Then, I rolled out the dough on my counter into a long rectangle and brushed the melted coconut oil onto the dough, sprinkled it all with the brown sugar cinnamon mixture, and rolled it lengthwise, and cut it into 12 rolls. I placed my rolls into a 10 1/4 inch cast iron skillet and covered them for another 45-minute rise session. For this one I placed the covered skillet on my stove while the oven preheated to help the rolls rise. Place bread dough in a large bowl, cover with a damp towel, and let rise in a warm place for 45 minutes. Roll dough into a long rectangle and brush with melted coconut oil. In a small bowl, whisk together brown sugar and cinnamon. Sprinkle mixture onto coconut oil. Roll dough lengthwise and cut into 12 pieces. Place rolls into a baking dish and cover with a damp towel. Let rise in a warm place for another 45 minutes. In another bowl, whisk together glaze ingredients until smooth. While rolls are rising, preheat oven to 350˚F. Bake risen rolls for 25-30 minutes, or until golden brown. Remove from oven and let cool for about 5 minutes before glazing. Serve immediately. This recipe is easy and very tasty. For the glaze, I used Coffee-Mate Natural Bliss Caramel Flavored Almond Milk Creamer since that is what I had on hand and it worked well. Would this recipe work if I put it together ahead of time and then put it in the fridge overnight, pulling it out 45 mins before baking? I haven’t tested it, but I think it would be fine. 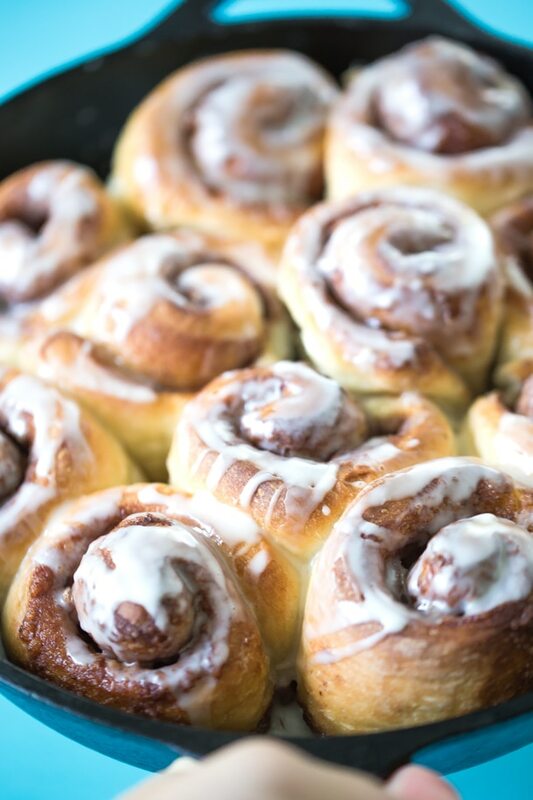 If you can do it with regular cinnamon rolls, you should be fine to do it with these!